Got a sporty dad in your life? Want to be one? This one’s for him….and you….and moms as well. This was published in Squash Magazine a few months back, but it feels especially appropriate for Father’s Day. If this doesn’t get you out hitting (or throwing) the ball with your family this weekend, I don’t know what will. Have a great day. The guy is all over the court—front, back, sides, middle—hitting low reverse corners, floating lobs, and hard cross courts to the left wall, aiming to get it past an opponent with graying hair and probably thirty years his senior. But more often than not, the older man gets it back, and early in the first game the ball is hit hard down through the middle, catching the younger man off guard. He whips his racquet behind his back and takes a stab at the ball, nicking but not hitting it true. His head dips down. “Sorry, mom,” he calls out. But his mother isn’t in the gallery up above the court, watching as I am. She is on court with her son, playing the right wall in the mixed doubles semi-final match of the U.S. Century Doubles Tournament. While her son is bounding all over the court showing remarkable athleticism, her forte is experience and patience; she knows when the ball is hers and while she doesn’t hit it hard, she knows where she needs to put it, steadily hitting the ball deep into the back left corner. This strategy definitely worked on every other team up until this semi-final match—including my partner and I. No matter what we did, we just couldn’t put the ball somewhere the son was not, at least not enough times to get a game. But it kind of makes sense . . . most guys I know are pretty protective of their mothers. And vice verse. Even if my partner or I had legs as nimble or hands as deft as this fellow, we were already at a psychological disadvantage. But every team eventually meets their match, and this was the case in the semi-finals. What kind of team might possibly meet or surpass that filial bond? Another filial bond. And possibly a stronger one—father and daughter. The gray-haired gentleman was playing left wall to his daughter’s right wall. And when I didn’t hear any apologies from either daughter or dad, I knew they had a good chance. There’s only so much running a guy can do . . . and doubles is a game where brains can overcome brawn. WIth her dad’s rapid reflexes and soft touch drops and her own excellent blend of reverse corners, drops, and lobs, this quick and clever woman out-witted one of the fastest-paced players of the game. While I’d like to believe that the guy had as many ‘sorry mom’s in his match against me, he probably just ran out of breath in this one. The final score: father and daughter won three games to one. At match point, I cheered. Quietly, though, since I was sitting with another father; his son and wife were on the losing side, although both had played admirably. I saw a lot of admirable play during this tournament—one of the most fun competitions I play in all year (you and your partner’s ages must add up to at least one hundred), but watching a father-daughter team triumph and continue to the finals hit a bittersweet chord in me. 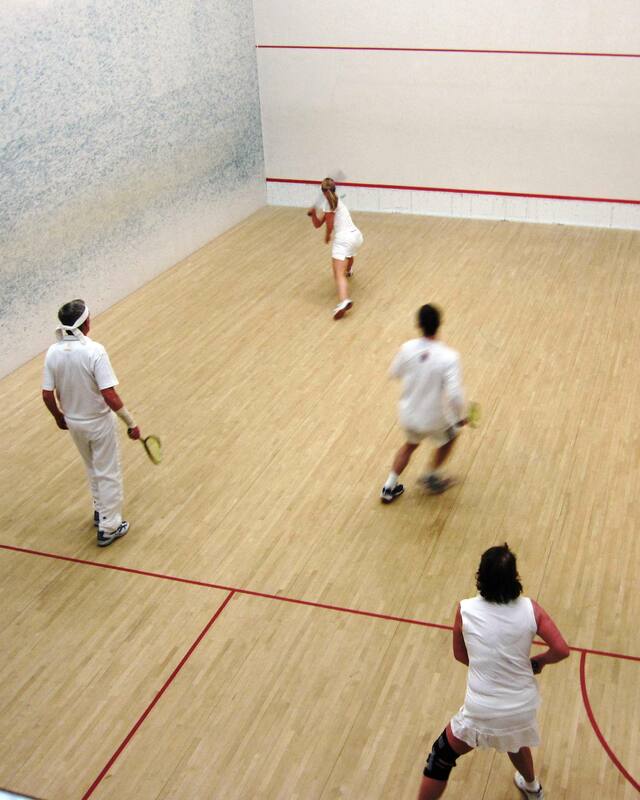 My own father introduced me to squash at our little local YMCA oh so many years ago. Squash never became his sport—he was too in love with tennis, and played clay-court doubles at least three times a week—but now that I’m playing doubles squash, I think we would’ve made an excellent team. He with his years of tennis-playing patience and extraordinary touch, me with my speed to make up for his worn knees. I don’t want to end this article on a down note. 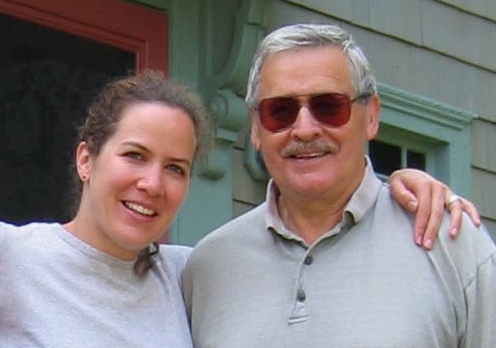 My dad died over six years ago now, and I can only dream of our doubles team. But it’s clear from the smiles I saw on the court that Century semi-finals day, that playing squash with family can make a flesh and blood bond even more special. That’s why when my brother said to me recently, ‘Want to play the Century in six years?’ I didn’t even hesitate. Great piece, Tracy. I’m assuming you were referring to the M’head Y. I used to go watch my dad play handball there when I was a kid, climbing that intimidating ladder to sit high above the court. Did I imagine that? I’ll be looking forward to watching you and Clay in 6 years. Thanks, Rob. I had totally forgotten about that ladder to get up above the court, but you’re absolutely right! (Or we have the same crazy imagination.) Think you had to go through the weight room to get to it — another intimidating place!